Bears spreading their legs into others’ space is taking place on public transport systems all over the world, especially with the sudden and mysterious rise in the bear population. It takes many forms, ranging from a slight invasion of someone else’s personal space, to what ends in a complete public mauling. 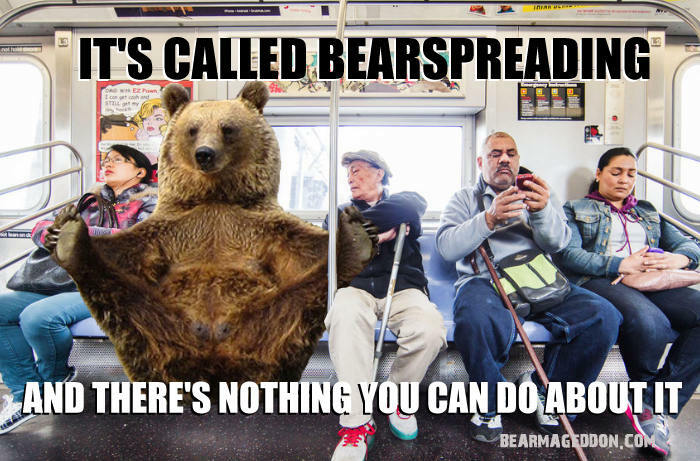 “Bearspreading” is the now official term, and despite a campaign and tons of nagging and bickering on social media to end it, nobody had been able to do a damn thing to stop bears from sitting however the hell they want to. Signs reading “Bears…stop the spread” have been rolled out on train and metro carriages across the city as part of an effort to improve bear train etiquette. The signs have been ripped to pieces and soiled with bear excrement. “I don’t know why we wasted money on those signs. 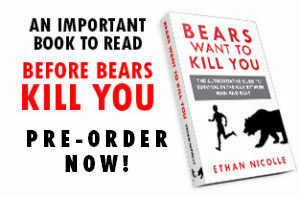 Bears can’t read,” said subway operator Juan Costanza. Regardless of campaigns and hurt feelings, bears haven’t changed the way they sit and in fact have taken to exaggerating their spread whenever possible as if they mean to aggravate the other passenger intentionally. “Real ornery creatures,” commented one passenger who had to sit and try not to breathe in the toxic smell of the bear’s open hind parts all the way from Staten Island to Times Square. Last week, when subway officials tried to confront a nearly 2000 pound grizzly who was bearspreading during the morning rush, several were injured and nine died in the outlash that ensued. Ethan Nicolle does not ride subways, but he does ride airplanes, and he wonders if there is a difference between manspreading and obesespreading. 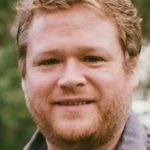 He is author and illustrator of Bearmageddon, Axe Cop and the upcoming Dickinson Killdeer’s Guide to Bears of the Apocalypse: Ursine Abominations of the End Times and How to Defeat Them.